John Wayne, The Duke, is an American icon and a picture of American strength.. There were few movie stars bigger than John Wayne, and even today he remains one of the most popular and recognizable figures in the world. John Wayne beat lung cancer in 1964. Between that victory and his death from cancer of the stomach in 1979, he used his passion to help others fight this terrible disease. To honor his memory, his family created the John Wayne Cancer Foundation (JWCF) with the mission to bring courage, strength, and grit to the fight against cancer. JWCF funds novel and innovative programs that improve cancer patients’ outcomes and save lives through research, education, awareness, and support. The Foundation established the John Wayne Cancer Institute at Saint John's Health Center in Santa Monica, CA, which has led to groundbreaking procedures and treatments. JWCF also funds an innovative skin cancer awareness and prevention program for youth called Block the Blaze. Prizeo, the leader in online sweepstakes and experiences, has partnered with JWCF to launch a fundraising campaign within the #ShowYourGrit movement to take John Wayne’s message of hope global and encourage people to fight the disease with courage, strength and grit. How would you like to honor John Wayne’s legacy and help raise money for the John Wayne Cancer Foundation as part of the John Wayne Cancer Foundation's #ShowYourGrit campaign and also have the chance to win a trip to Nashville to attend a show of your choice at the Grand Ole Opry, including a backstage tour? Flights and hotel accommodations are also included, featuring a 2 night stay at the magnificent Gaylord Opryland Resort. That's not all. Hold the reigns and saddle up, Pilgrim. 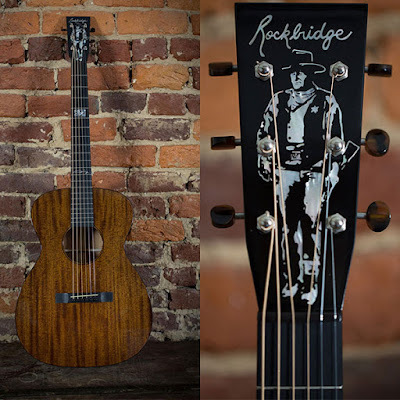 You'll also win a custom made, one of a kind, John Wayne Rockbridge guitar which will be presented to you personally by John's granddaughter, Jennifer Wayne, of Runaway June! The guitar is absolutely gorgeous, made of pure mahogany, front Mother of Pearl inlays and amazing custom John Wayne imagery, including the Red River D belt buckle. The rear inlay is a silhoutte of John Wayne crafted with ebony and wood from John Wayne’s personal yacht, The Wild Goose. For a donation of only $10, you’ll be entered for a chance to win this great prize and you'll be helping a cause that all of us have been affected by in our lives. Cancer is so prevalent these days, shouldn't we do what we can to help prevent it? Donate more and you’ll get extra chances to win, plus some exclusive T-shirts and bandanas to #ShowYourGrit in the fight against cancer. We're taking John Wayne’s message of hope global to help fight cancer. The #ShowYourGrit Prizeo campaign will be live through July 14. Thank you for showing your grit against cancer and we'll hopefully see you at the Grand Ole Opry!